I couldn’t decide if this is a project or a review. So, review it is. I have been wanting an Alaskan Chainsaw Mill after being able to look at one that my friend had. It is the standard aluminum mill (brand not important). It was nice, adjustable, strong, well made, and I would have loved to try it. Unfortunately the saw stopped working before I had the chance. So as someone that had to have one I went straight to Amazon and looked it up. My first impression was, “$$$Holy Crap$$$” Another case of I had to have one but the wife would have laughed and we all know how that goes. So to the drawing board (Sketchup). I knew I could just buy the 18” mill for $180ish on Amazon. So, that is the starting point. My goal was to build one for MUCH MUCH MUCH less. My material were about an hour on Google Sketchup, one 2”X10”X8’ from the BORG, nuts, bolts, and washers. I also used a pin nailer for the lamination, clamps, a couple extra screws and of course glue. For the Alaskan Chainsaw Mill parts less the nails, screws, and glue I spent a grand total of $14.04. This turned out to be a 93% savings. That works for my budget. 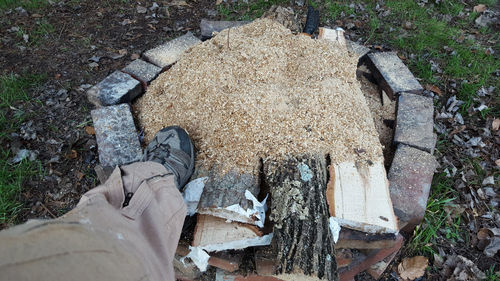 For adjustability, I made it to rough cut logs slightly larger than ½”, ¾”, 1”, 1 ½”, 2”, and 3”. It still has about 4 to 6 inches left for larger adjustments and could have been made with more. Those are just the most frequently used sizes in my shop. The max cut is only 10” which is about 2” to 3” smaller than the manufactured versions. I’ll make that trade about 11 more times to save the money. It’s better than my tablesaw mill I was previously using that maxed out at 6ish” logs and a whole lot more work. For that mill check out Izzy Swans tablesaw mill. I noted that aluminum is about 8X stronger than pine/doug fir. I compensated with much more wood and laminated some of the parts to make a foe mortise and tenon. This might have decreased the max cut but again. REMEMBER THE SAVINGS. 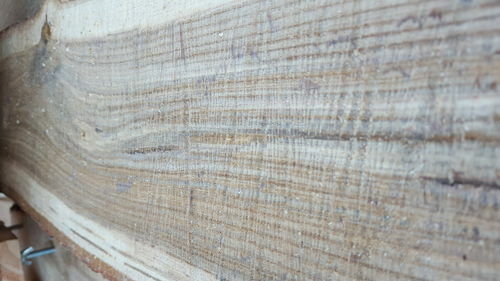 Quality of cut, much rougher than the tablesaw mill. Definitely falls into rough sawn realm as expected. All of my adjustable settings are about 1/8” larger than the dimensional size to allow it to be dried and run through the bench top planer in the future. We’ll have to see if that is enough in the future. I still need to rub on some mineral oil to help protect it and ease the movement of the adjustable arms. All in all I would recommend building one. I have the Sketchup design for the dimensions. If you are interested in looking at more pictures of the build and first cuts check out my Facebook page and look under timeline photos.. Link below. If you are interested in my thoughts and/or the Sketchup design PM me here. You can also get them if you like my Facebook page and send me a Facebook message. One thing that I would recommend is to cut lumber at least a 1/4 but preferably 3/8 oversize. I learned this the hard way when I first started chainsaw milling. Other than that nice build. Thanks man!!! I appreciate the tip. The 1/8” decision was spare of the moment and not based on research unfortunately. That’s my bust. This is still more of a prototype. I’d like it to still be easier to make for someone just getting into chainsaw milling. I know at least two things I would change for the next build but that’s all part of the experience. I’m going to use it for a while before then next build so I can find a few more kinks. I’ll probably make plans for the next one. Yea for people who do not want to spend $180 or $200 your design could get them into the milling world. It appears simple and effective. I was wondering do you get enough bar clamping pressure with the wooden pads and what was you approximate milling speed in that maple with the electric saw (feet per minute)? I have a husquvarna 390 xp and now that I have used it will never go back to using small saws for milling. I get about 8 feet per minute in hard maple over a 12 inch wide cut. Thanks for the support. I appropriate it. As far as clamping pressure and speed. I will have to get back to you on that. I have only made 4 cuts on a log that was about 6”-7” wide on I’m guessing hickory. So far though, no slipping. The pad is wood but I super glued a rubber glove to the pad. I forgot to mention that. So I suspect it shouldn’t move much. Plus I’ll have to sharpen the blade at some point and I’ll take the mill off, sharpen, and readjust for now. Version 2.0 might take the sharpening into account better. The pictures of my Facebook page probably does better at describing the construction. Oops, I was trying to figure out what type of wood that was but could not tell very well over the computer it looked like hard maple. I would like to see your facebook but I dont have one so this will have to do. I know there is a giant dark colored, what I am guessing is oak and a hickory. I think that chunk came from very close by. I don’t recall exactly which one it is. Does that coloration fit one of those? This one shows me glueing the glove to the bar pads. I have also made several more cuts today. The chainsaw bar didn’t slip but the blade would occasionally develop a slight twist or offset from parallel with the mill. I’ll have to think about how to adjust that. It might have been just starting to vibrate lose a little. Nothing a precheck before every cut couldn’t fix. I think tightening the clamp bolts generally fixed it. 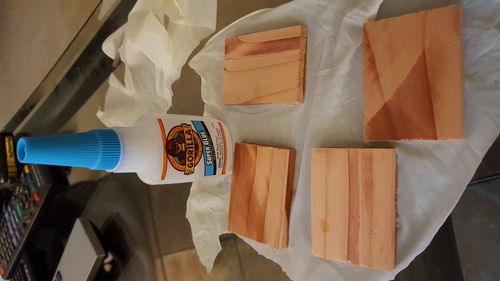 Might also help if next time I use some hard wood for the parts that can cause the offset of the blade. 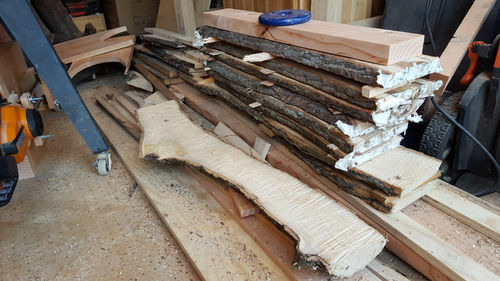 Of course that would make the mill a little less accessible to others on a tight budget until the milled logs dry. Overall it was a very minimal problem for the amount spent. After all was said and done. Lots of saw dust. I have done a lot of reading about these mills but nothing really could prepare me for what it would actually look like. That is my burn pile. It will need to be burned again soon to keep up with the amount of dust this mill makes. After today’s work, its time to sharpen the blade. Probably makes about 10-12 cuts on boards of that size before I need to resharpen. Good times. Just a quick view of the electric chainsaw and mill in action. Just click on the date below. The mill is still working well. Not fast using the electric saw but it gets the job done. I have been able to use some of the boards from last year and after some drying and planing I am very pleased with the free hardwood. More pictures and videos of the mill in action on my Facebook page. Link below. Well done! Is a great mill for small logs. Thanks for sharing. Greetings. How is this working long term? Still working well last I tried it. I have been enjoying the locally sourced hard wood from the local woods. If I have a little scrap hardwood after the holiday gift making and the Matthias bandsaw side project, I’ll probably remake it again a little bit less beefy and out of hardwood. I think the mill could use some trimming up to increase the cut capacity. As typical with a prototype, it got over built. The ~11” cut capacity could be increased to roughly 13”. Only problem is the logs of that size are so heavy in 48” lengths. I have stopped harvesting logs smaller than 6”. I recently harvested and sealed some 10” logs. LOL!!! Now the only problem is the VW Golf pickup truck. To bad trucks are tough to make out of wood. I know this review still gets views. Just another update. Still working great. I’m starting to plan out an easier to build version which addresses many of the issues from the first one. This video was from December 30, 2016. I needed to replenish my stock of hardwood after the holidays. Can you post that link again?